I’m alive! My postings may be slightly more sporadic as I am entering my final semester before graduating with my Bachelor’s Degree! I’m very excited but there is a lot of work to go into this semester so I may have to sacrifice some of the time I would have spent on my blog on that. Never fear though I will always try to get posts out as much as possible. I would miss this blog terribly so I won’t cut it out even for a semester. If ya’ll have something special you’d like to see or some kind of feature idea feel free to contact me via the site and I will see what I can do. Come summer ya’ll will be sick of me again as I will be back to my 2-3 time a week postings! Today though I have an amazing collection to show you. I have all but one of the collection but I think that you will get a great idea of what this collection is all about. 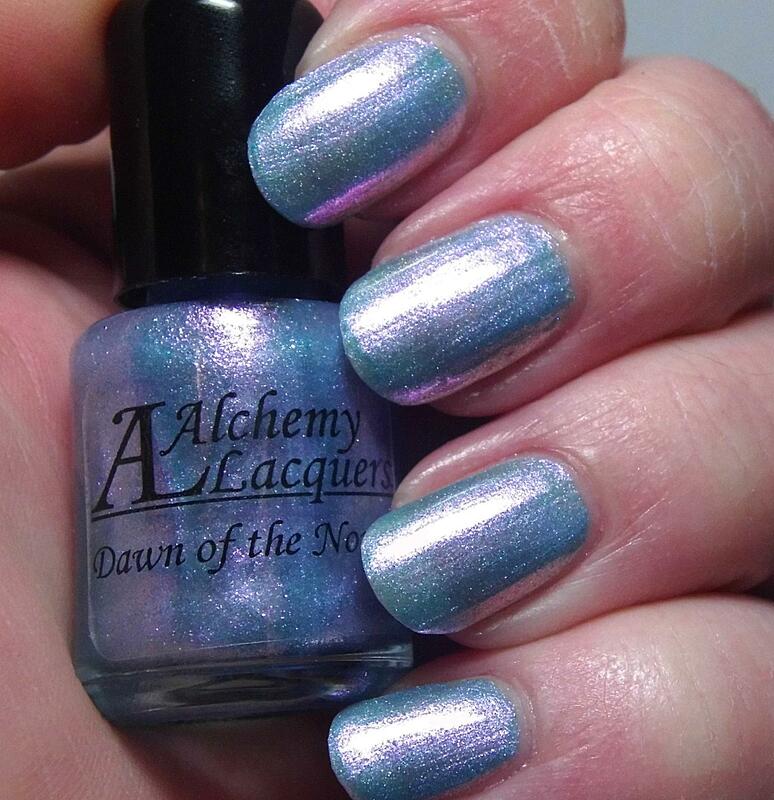 It’s no secret that Alchemy Lacquers is one of my all time favorite brands. Rebecca consistently improves on every single collection she puts out. She just keeps getting better and better and this current collection is so so beautiful and perfectly represents the theme! These polishes are all currently available and I will include all the necessary links at the bottom! 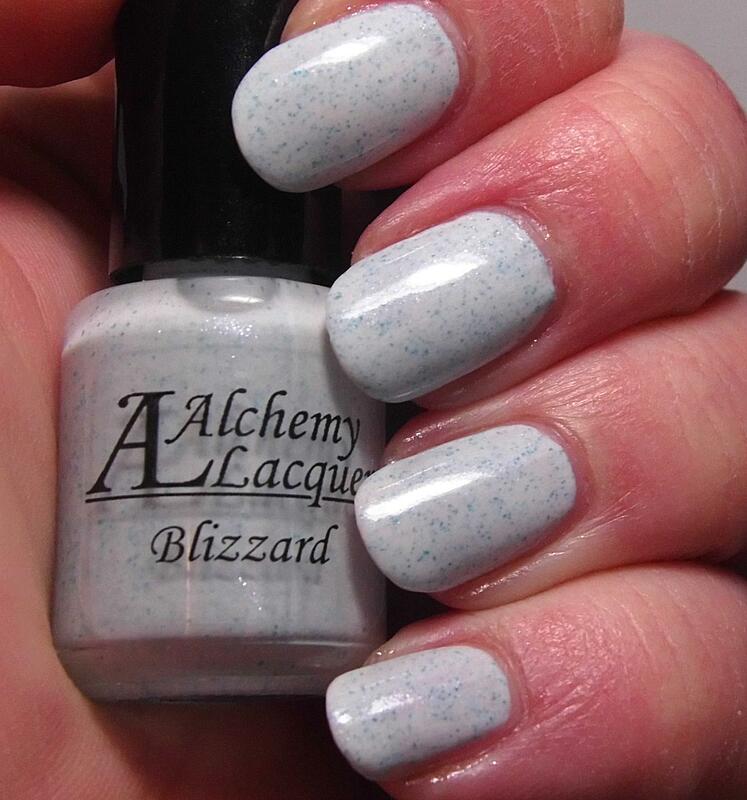 Blizzard is a perfect pale pale pale blue with a light shimmer and teensie tiny blue speckles. It makes a great base for nail art and could even provide undies for some of the collection polishes if you didn’t want to build to opacity. Application is lovely. You can see there aren’t any streaks or drags and it applies very smoothly. Two coats to opacity without any trouble. Sometimes cremes are a bit difficult to work with in these lighter colors but the consistency is perfect. Just look at that! I’ll give you a moment…. Awesome right? I love love this polish so much. 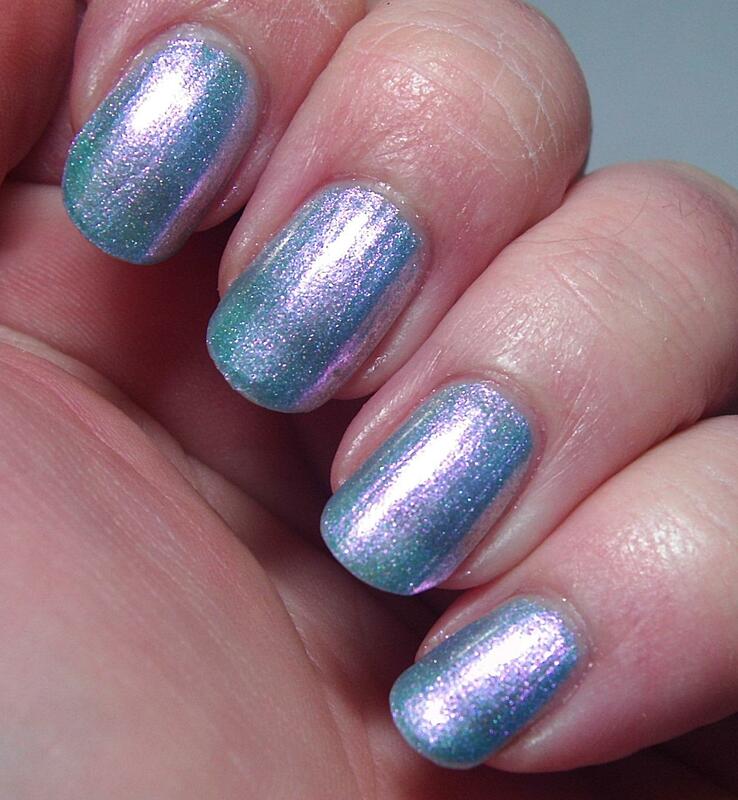 This is a light blue jelly multichrome polish. It’s so shifty! It shifts from a sort of golden to pinkish purple and some slight green here and there in corners. The shifty is so strong that you can see it here without a lot of contortion or heroic acts. Love! Isn’t it lovely? It does go on sheer but it builds to opacity, I have a very defined nail line but me and VNL are copacetic so I don’t mind a little VNL now and then. The sheerness in this and a couple others do not bother me in the least because to me it fits the theme quite well. These pictures show three thin coats plus topcoat. You could use undies but to me it would detract a little from the loveliness. Polishes used: Glisten & Glow – Stuck on Blu; Alchemy Lacquers – Dawn of the North; Digital Nails – Ain’t Nobody Got Time for That Topcoat. Oh.Em.GEE! It’s like Rebecca asked me what I wanted for Christmas and then made this. Seriously everything about this polish makes me happy. 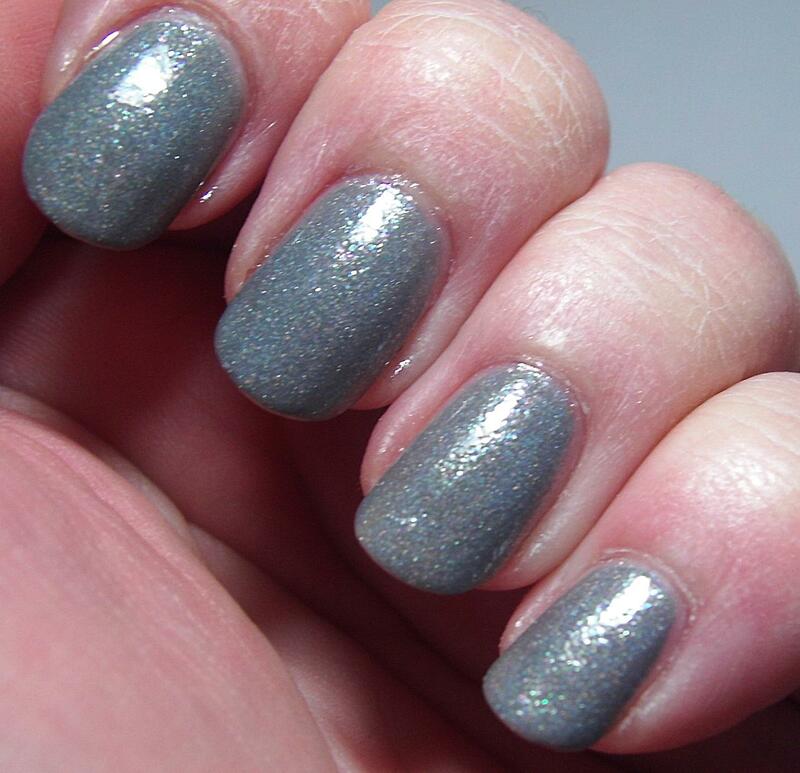 It’s a creamy grey crelly with a subtle linear holo and rainbow microflakies!!! LOVE! Application for Permafrost is the height of perfection. Self-leveling smooth application. The pictures show two coats plus topcoat! Polishes used: Glisten & Glow – Stuck on Blu; Alchemy Lacquers – Permafrost; Digital Nails – Ain’t Nobody Got Time for That Topcoat. 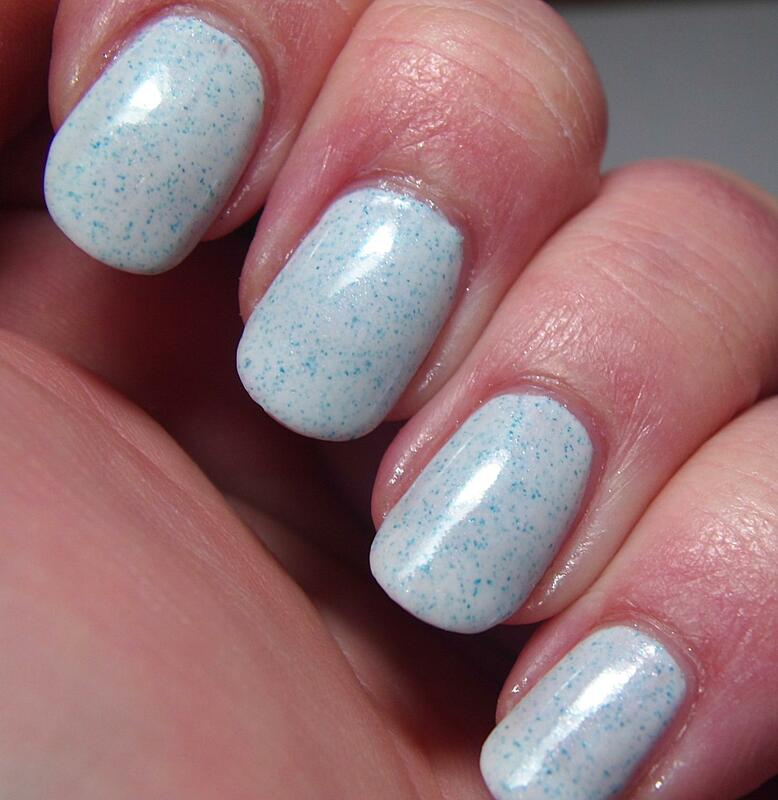 Graupel is a perfect mix of white and ice blue satin glitters and white matte glitter in a clear base. It would look amazing over a variety of undies and I chose to pair it with Permafrost because well they just seemed to go together naturally! This glitter topper went on great without any issues at all. This is one unmanipulated coat over undies and topped with topcoat. Because the glitters are smaller gauged they don’t need a lot of help to smooth out. Polishes used: Glisten & Glow – Stuck on Blu; Alchemy Lacquers – Graupel; Digital Nails – Ain’t Nobody Got Time for That Topcoat. This post is to be continued with the remaining four polishes that I have in my possession. Trust me you will not be disappointed the gilded offering is coming up! 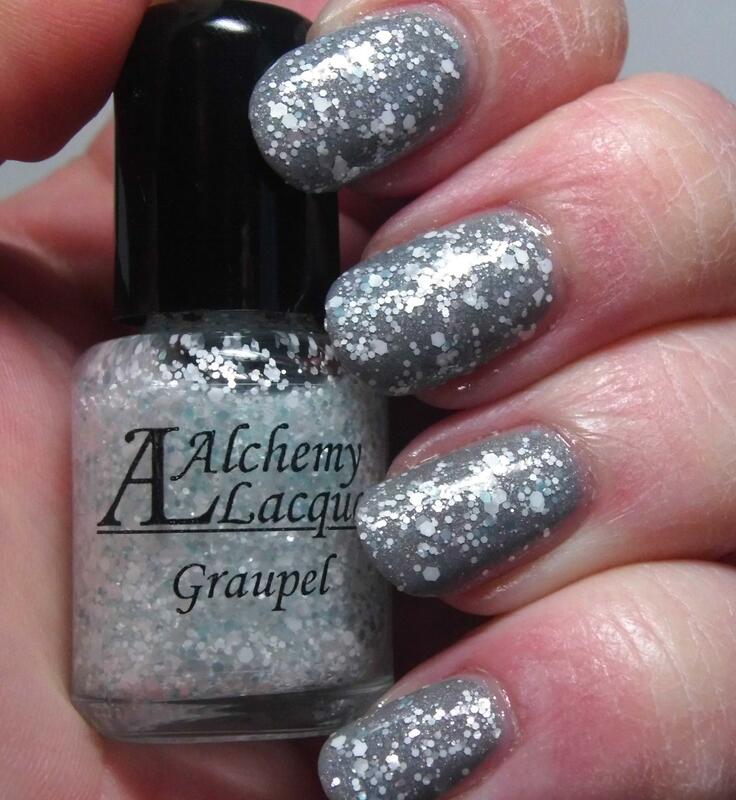 In the meantime, you should totally go check out the Alchemy Lacquers’ shop and snag up your own bottles of these amazing polishes. 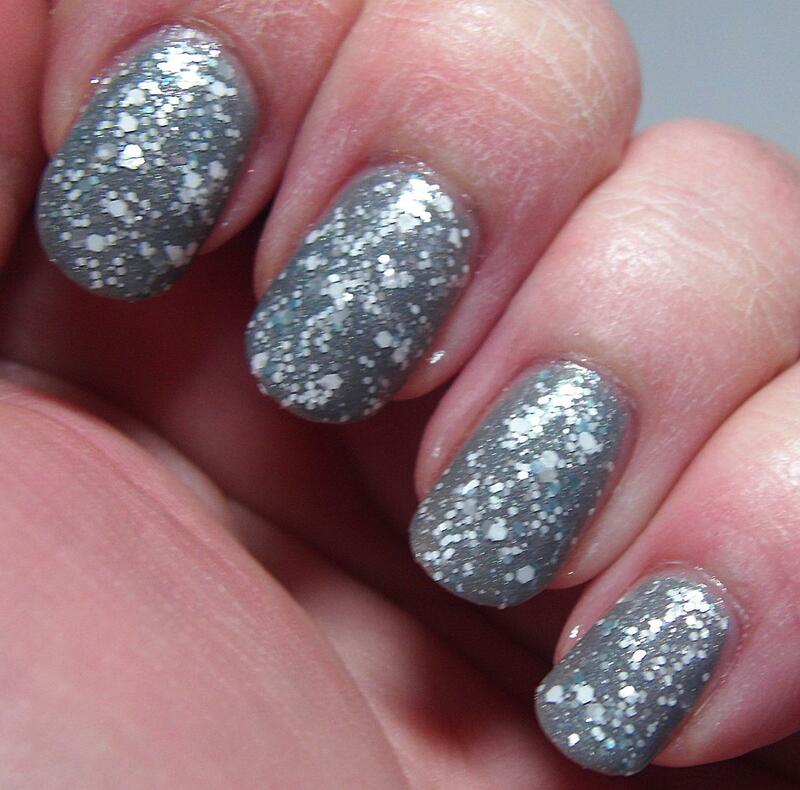 You can also follow AL on Facebook and Instagram to see more amazing swatches and pictures! This entry was posted on January 18, 2015, in Alchemy Lacquers, Indie Polish, Seasonal.